On Friday evening, I had an opportunity to unpack, set up and download the files to set up my new Silhouette Cameo. It was easy, and a delight! More details on the card: The background is a vintage pattern I got from Vicki Chrisman on her Etsy shop (http://www.etsy.com/shop/VickiC). It wrapped a vintage mini-mold that held the tiny spools of thread (at left, front of the photo) as well as the vintage buttons and S&H green stamp. For the images of the tops of the spools, I simply sat the two spools of thread on my copier and created my own vintage embellishments from the cut-outs. The pearls around the Sophie doily are from Mei Flowers. I set the sentiment on my computer and after cutting it with a Spellbinder's label die, I sponge-tinted the background of the label using Copic markers (pink and cool grey) and a blender (00) marker. The "stick pin" is an old embroidery needle. Pink thread by Coats & Clark. Faux stitching using a Gelly pen. 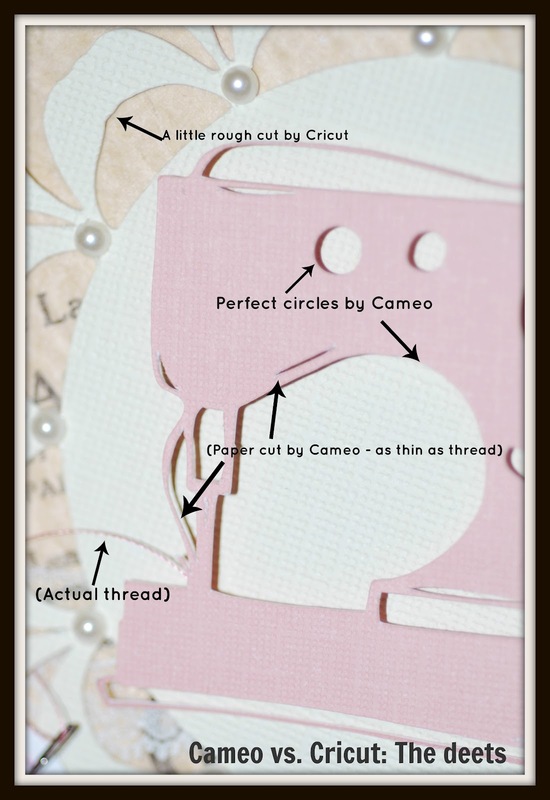 I purchased and downloaded the vintage sewing machine image from the Silhouette shop, downloaded it to my Cameo and cut it at 3.5” on Core’dinations cardstock, using the default settings to cut. I was amazed at how finely cut the paper is (see the top bit representing thread on the machine, which is only slightly wider than the actual thread I wrapped around the spool). A downside: the new mat is so sticky that one fine swirl of“thread” to the left got stuck/left on the mat when I removed the image. The booklet that comes with the newer cartridges recommends minimum setting sizes for each image – and this one was 5”. While the image is cut cleanly (and I used a new blade for a fair comparison), it is far less smooth than the image cut with the Cameo. The curves are a bit jagged, and some of the smaller connections were more fragile than the Cameo’s tiniest cuts. For crafters who like the simplicity and guidance of images in a collection on a cartridge, a Cricut is for you. I have the Cricut Expression and a Cricut Cake. There are also a Cricut Expression 2, the smaller Cricut personal, the original Cricut Create, and the smallest Cricut Mini. ProvoCraft also sells a Cricut Imagine, which combines color inkjet printing and cutting together, for enhanced print/cut capabilities. On the downside, if you limit yourself to a Cricut, you will not be able to use the vast array of millions of images created worldwide in the SVG format. However, ProvoCraft now releases dozens of new cartridges weekly (announced on “Hello Thursdays”). ProvoCraft has expanded into a broader per-image market with the introduction of its new Cricut Craft Room (accessed at http://www.cricut.com/craftroom/default.html). If you have some computer knowledge (PC or Mac-based) and want to add to your capabilities beyond the cartridges but don’t want to (or can’t) invest in a new cutting machine, adding Cricut Craft Room (CCR) to your mix might be the next logical step. Oh... REALLY love your card! I'm so glad you liked the goodies you ordered :) Now I'm following your blog, so I wont miss a thing :) Thanks again for your order!! Fabulous card! I really like having both my cricut and my craftrobo it gives me carts for quick cuts and the ability to make my own when I want to spend the time. 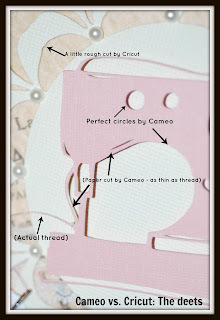 I have the Cricut and was lucky enought to get a program to use it with SVG's, the Cameo though is on my wish list. Beautiful card!!! And yes don't you just love the cricut craft room?? ?